There are some easy steps you can follow to remove your acrylic nails painlessly. This is a guide about removing acrylic nails. I just removed my salon acrylic nails and my nails are thin and weak and rough. Any suggestions to help repair them? I had acrylic nails about 25 years ago, and left them on until they started popping off, then soaked the rest off in nail polish remover. I didn't really notice any weakness in my nails, but they didn't look nice until after they had grown out. Get some wraps. Wraps will grow out nicely and allow your natural nails to look nice while growing them out. Wraps do not need to be maintained. Once they grow all the way out and your natural nails are now strong, you're done. Wraps will help brittle thin nails to not break off while you are growing new nails, btw. Rub warm olive oil into your nails and the nail bed at least once a day. You will be pleasantly surprised at how fast they grow out and how healthy! I had acrylic nails put on and they were pretty grown out. I hit my pinky nail and ripped a small bit of my real nail off. As you can imagine it's very painful. I took all my other nails off and had no problem, but I'm trying to find a way to get my pinky nail off with there being already a ton of pain and swelling in my finger. I'm afraid to do the soak or use a cotton ball with the thought of it burning and the nail is not lifting to put a piece of floss under to try to get it that way. Please help I just want the nail off maybe it'll help the pain and healing process if the acrylic nail is off. In this case, you will want to treat the nail like it is your natural nail. It has already been traumatized, and may have small open wounds which would make using acrylic nail remover torturous and dangerous. Trim the nail as close to your fingertip as possible. Wear a band-aid on the finger, to minimize contamination and re-injury. As it grows, trim it, until either the ripped part has been trimmed off, or it is healed enough to use nail remover. After you remove the acrylic nail, give it plenty of time to heal and become strong on its own, before using any false nails. Keep it trimmed close, and just let it grow for a while, until it feels stronger. Good luck! For 1 year, my fake nail has been over my own nail. The doctor said it will grow out, but it has been a year. It is nasty looking. My friend said go to another doctor and see about having my finger numbed around the area and cut cuticle and separate the fake nail and my own nail. The fake nail seems to be under cuticle. Help. Pam, I had acrylic nails for a few years and was fortunate that no damage was done to my real nails. It takes awhile and patience but you soak and soak and soak some more in acetone. Good luck. You better go to a different doctor! Go to the nail place and let them soak your nail in acetone. The nail will come off. They do it every day. Is it acrylic? If so, you just soak it in acetone nail polish remover and it will disolve. If it's not acrylic, please post more detail. Also, I can't understand how an artificail nail could still be under the cuticle after a year. When I had acrylic nails, I had to go get them filled in every 2 weeks because they would grow out. What is an easy and safe way to remove an acrylic overlay over natural nails? When I used to have them the manicurist told me to soak the nails in regular nail polish remover. With the acrylic nails if you want to change the color of polish yourself you are supposed to use a special polish remover. It has been so many years since I have had them, that I can't remember what the different removers are called. The regular polish remover does work good, but it is time consuming. My nails now grow so fast, I have a hard time keeping them at a usable length. I figure it must be because of all the OTC supplements that my doctor has me on. I removed mine with hot water. I just soaked my nails and pulled them gently off.I used tweezers to help. At the nail salon, they do same thing.My nails took about 2-1/2 years to return to a semi-normal state. They have been a mess - peeling, breaking, soft, soft, soft! Not sure if you mean the new ones that look like what we use to call "fake" nails or not that you used a glue to put the complete nail right over your own, if it is that glue is like super glue. I tried them and had a terrible time getting them off, after all it is super glue. No way would have hot water taken mine off. I had to remove them the same way as the liquid acrylics that are built up. You use acetone nail polish remover to soak them in, be very gentle removing the acrylic so as not to do any more damage to your own nail. The acetone is what melts the acrylic. Don't gouge or scrape your nail, use a wooden stick such as an orange cuticle stick from a manicure kit or popcycle stick would work. Just be patient and let the nail polish do it's work, it will take quite a while but it will be the best method for your real nails. Do not peel the acrylic off when it feels like it will come just keep pushing the melted goo off until you are down to your own nails. I can't stress this enough especially if you have worn the acrylics for several years. Your own nails are most likely going to be soft and easily damaged, good luck from the voice of a slow learner, took me three times until I learned my lesson. Still paying the price with ruined nails 15 years later. I have to agree with everyone who said it ruined their nails. Mine were thin and weak to begin with but now they split vertically so much that I can not even begin to grow them out. I wish I never would have started with them. It has been about 15 years since I used them and if I had it to do over, I wouldn't do it. When they were removed, there was bleeding under my own nail! How do I remove my acrylic nails after wearing for one week? Soak your entire nail bed is pure acetone. I am not sure if I spelled it right, but that is what you need. Sharon is right...you can find nail polish remover that has a high acetone content. Fill a small glass container with the liquid and soak your nails in it until they fall off. Be sure to moisturize your nails well afterwards, as the acetone dries them out. I am not able to get acrylic product off my fingers. When attempting to remove acrylic nails by soaking as usual, it appears this product only dissolved enough to spread all around the cuticle and entire finger. I have searched everywhere and cannot find any similar situations. I have applied and removed acrylics many times, but this one product is the only one I have ever had this problem with. I have tried more than once to soak, but it doesn't seem to remove the product, it just spreads and hardens again. In good lighting and magnified, you can see what appears to be a yellow, shiny product. It appears that the product is still covering the entire nail, leaving this shiny yellow coloring. I have attached a picture. Can someone please help me? If any of the nail glue remains on your nails, simply buff this off with a nail buffer. Be gentle and use a light touch to avoid damaging your natural nails. Step 11 Apply a moisturizing hand cream to your hands and massage in well. This will help replace any lost moisture from the acetone polish remover. I use Vaseline, good luck. I currently have these bio gel nails which are the best quality nails on the market as they let your nail breathe and do not damage them, but they are expensive. I need to look professional for work and since my own nails aren't very strong and I am not good at doing my nails these are perfect and look incredible. I must say I am very happy with them. The problem is, I will be done on my work contract in a couple of months which means I will not have money for the upkeep, but I do admit I love this new french manicure look. I would like to know if anyone knows how to remove these bio gel nails (I saw information on acrylic nails on here, but I don't have those and I imagine the process is different). Also, what can I do to have an inexpensive french manicure look? I have seen fake nails at the drugstore and wondered if those would look as good. I would strongly suggest you have them professionally removed. I had nails professionally done for a wedding but afterward had too much trouble working with them on. I decided to take them off myself and nearly destroyed my natural nails. Over a year later my own nails are still weak. What are bio gel nails? My acrylic nail has snapped and so has my nail halfway down! It is very painful and I don't know how to get it off as soaking it in nail varnish remover is obviously very painful too. Can anyone give me advice at all? I have done the exact same thing once last week and I put a plaster over it and let my nail grow until the end fell off. I've now done it again more than halfway down my nail and can't possibly live for two weeks with this awful pain or longer even. So I need help too. But maybe the plaster thing will work for you!! 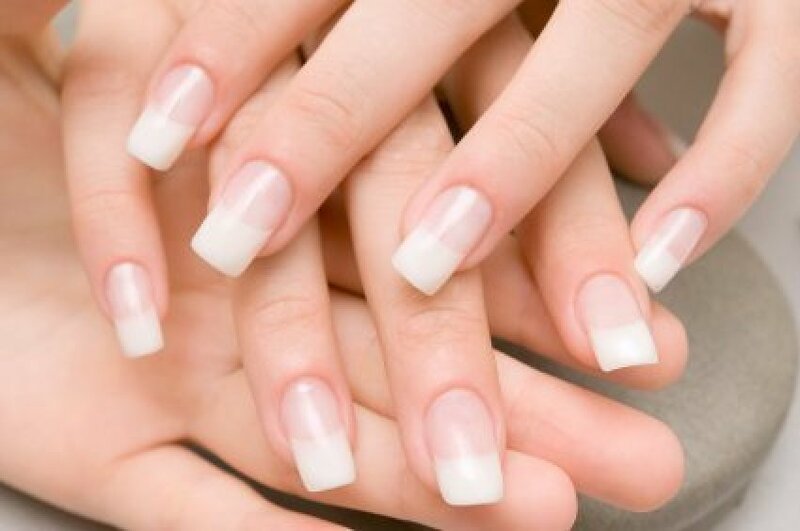 This is a guide about applying acrylic nails. Applying your own acrylic nails can save you money over going to the nail salon. If done correctly, they can be just as durable. This is a guide about life after acrylic nails. Finger nails can be weak and rough after using fake nails and need some TLC. It's easy to soak finger tips in a bowl of acetone to remove artificial nails, but how do you do toenails? I don't want to soak my whole foot in the stuff. Apply petroleum jelly or Alba brand Un-Petroleum Jelly (if you're sensitive to petroleum based products like I am) to the skin on your toes and around the nail bed to prevent your skin from absorbing the acetone. Try soaking a cotton ball in acetone and using a strip of aluminum foil to hold it in place for 15-20 minutes. Once you take the cotton ball off, the acrylic will immediately start to harden, so gently remove the acrylic from one nail at a time, starting with one of your pinky toes. This gives the acetone a bit more time to work on your bigger toes. How do I remove acrylic nails from my big toes? They were attached to my skin (because I previously lost the toenails). How do I remove acrylic nails so I can have gel nails done? How do I remove acrylic nails? How do I remove fake nails? I got nails about two weeks ago. They are not the whole fake nail, they are acrylic pink and whites and were put on with a paint of some sorts? I am looking for tips for how to remove acrylic nails.